We are a non-profit foundation that provides direct anti-bullying services, education, and support to students, families, and school administrators. Bullying Statistics - Bullying is the most excused social injustice. For many children, bullying is a silent, shameful event. Bullying causes depression, anxiety, physical ailments such as unexplained headaches, stomach aches, trouble sleeping and elevated startle response, hatred towards self and loved ones such as friends and family. Bullying affects children of all races, color, creed, national origin or sexual orientation. Read about current bullying events and stories around the world. If you or anyone you know is in need of anti-bullying services, please contact us at the email address below. If you, your child, or someone you know is being bullied, we want to help. As a non-profit organization, we rely directly on the contributions of individuals to support our services. If you are open to contributing some of your time, expertise, or funding for the health of our children, please join us! NAPAB advocates on behalf of bullied children and their families, providing education and support to parents, educators, children, and the community at large. Driven by Daniel's story, we exist solely for the purpose of providing social service to our communities. 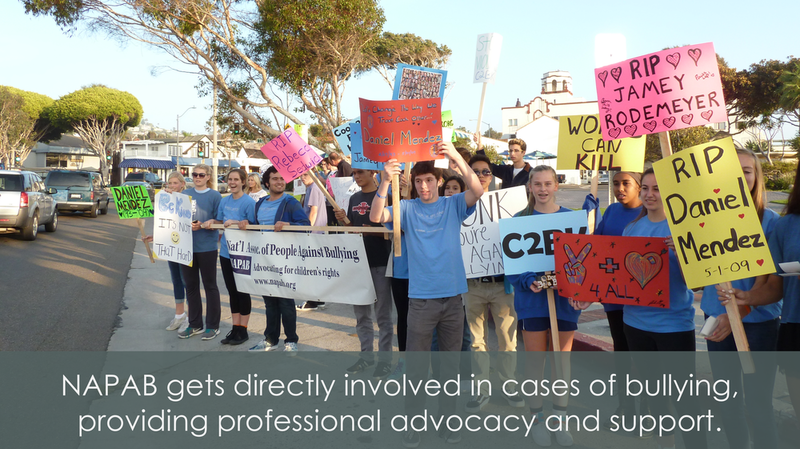 NAPAB advocates on behalf of bullied children and their families. Our goal is to bring about positive resolution between parties involved. 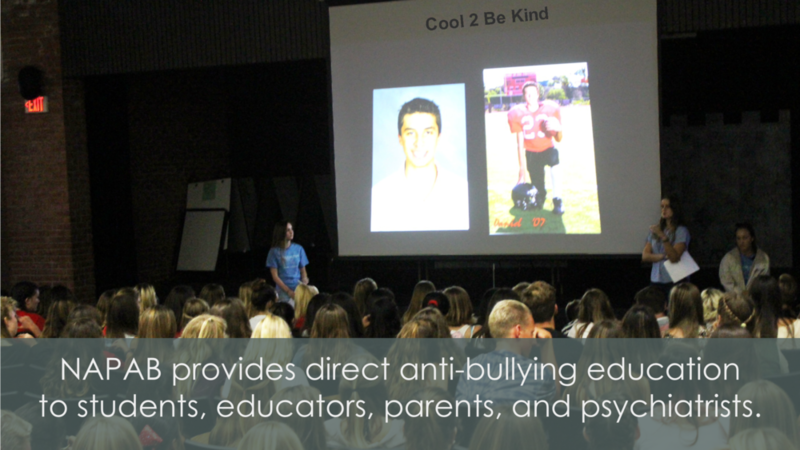 We help schools across the country begin their own Cool 2 Be Kind Chapters. We also provide education and support to parents, educators, children and the community at large in order to promote a harassment free society. Learn more under About Us by clicking on the picture below. Studies show bullying is reduced by over 50% on campuses where students begin anti-bullying clubs. Find out how you can start a C2BK chapter at your school.